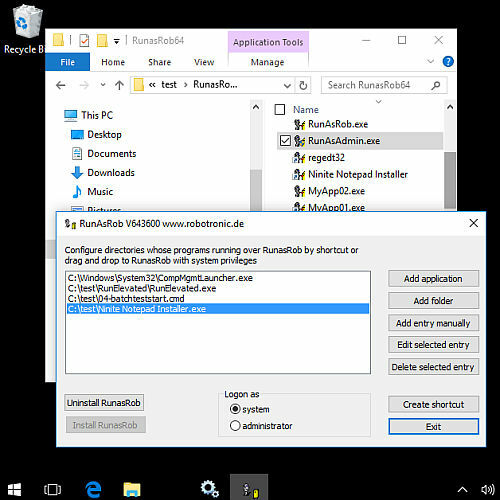 FAQ and how to use runas and other run as administrator possibilities on Windows 10. Run as admin from standard user account or run as admin from administrator account? Two different things. 1 ) run as administrator from administrator account with elevated privileges on an active UAC system. Elevated rights are needed from a program, batch file or other scripts, to get access to system relevant settings. This can be folders, registry entries, hardware and other windows system setting. An administrator has no elevated permissions on an UAC activated system, until he has not confirmed an UAC Dialog. This UAC Dialog is pop up, if the application required this elevated system rights. How can i get elevated privileges? The application request elevated privileges in its program source code. How can i get elevated privileges and bypass the UAC? Disable User Account Control and all administrators work now with elevated permissions in all applications without UAC dialog. 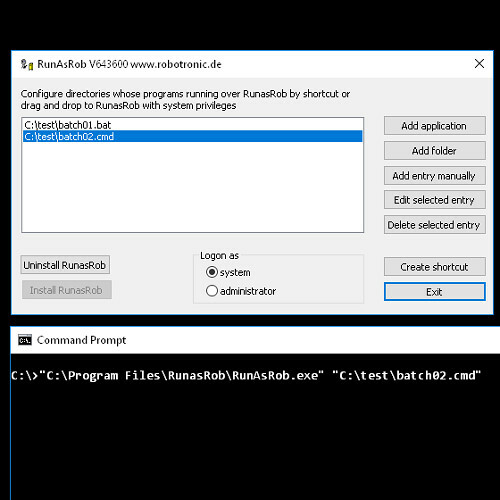 Run application under system account with RunAsRob https://runasrob.com/RunAsRobRunAsAdminAsSystem.html. System account knows no UAC and has more rights than an administrator. It has access to backup directories, user profiles and other system folders and settings. RunAsRob login as system, is a very effective method for a copy job, monitoring, installation procedures of programs, updates, patches or drivers. It is not suitable if you need the settings of a user account in the running application, like printers, shares or program settings, because the system account has not a full user account. Use the predefined local account >> administrator <<. 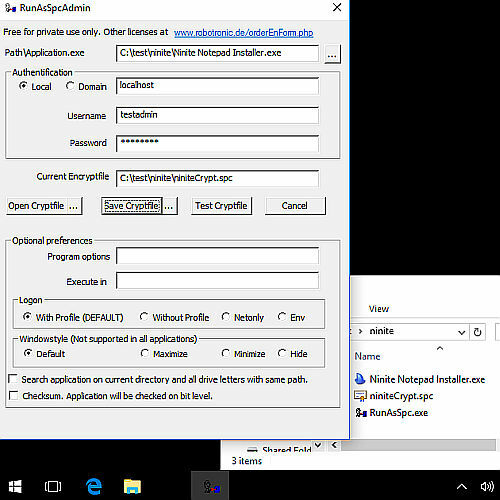 It is the only account which bypass the UAC on an UAC activated system. Why do i need to run an application as administrator from a limited account? Delegate specific administrator tasks to specific users or a user group. Enable to install an authorized software from a limited user. This can be an application, an update, a driver or any other installation package. 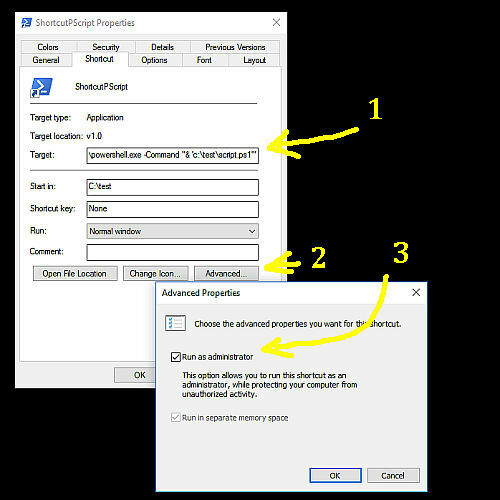 Allow a standard user to change a specific system setting. Authorize a copy job, a backup job or a monitoring job which need system rights, to run it from standard user. Enable working as administrator only when necessary and not regualary as standard account. An administrator should not work with an administrator account by default, because it is a high risk he do a fatal mistake unconsciously in his daily work. This security setting is a rule from linux since unix exist and microsoft implement this with User Access Control UAC. I see no other reason in the UAC than avoiding that administrator work as administrator. you can deaktivate the UAC and work from a limited account and use runas utilities to do the specific administrator job. How can i run an application as administrator from standard user account? Runasspc can also hide the password in an encrypted file. or as administrator with full profile of the calling user, because he will be an administrator with its own account, only for the authorized application. You can authorize one or more applications with wildcard in its path name and you can allow complete folder directory. 3) or RunAsSpc with encrypted file and hidden paassword. First of all, enable powershell script on machine. Now there are various ways. 1) Run script as administrator from admin account with elevated privileges. or elevate the powershell script by calling the script via another powershell start script, which elevate the main script. or create a shortcut to your Powershell script with command PowerShell.exe -Command "& 'C:\Temp\script.ps1'"
2) Run script as administrator from standard user account. Create a shortcut to your Powershell script with command PowerShell.exe -Command "& 'C:\Temp\script.ps1'"
After start of shortcut, you will be asked to enter administrator credentials. 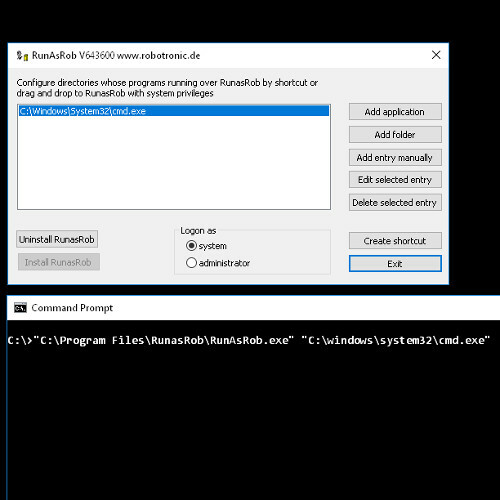 An elegant way to run Powershell script as administrator from standard user and avoid entering the credentials and bypass the UAC is using RunAsAdmin from RunAsRob. 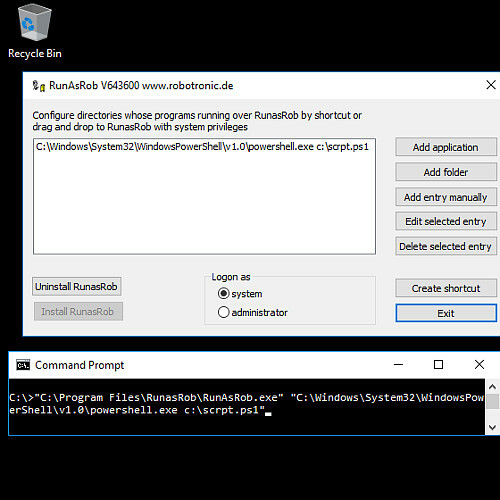 You just have to authorize the script in RunAsAdmin and launch it via RunAsRob. Now you can call scrpt.ps1 via RunAsRob and it is running with system rights under standard user account. Run command line with elevated privileges from administrator account. Run command line with elevated privileges from user account. Launch a batch file with elevated privileges from an administrator account. Create a shortcut of the batch file, select in properties of the shortcut -> advanced -> run as administrator. Start a batch file as administrator from a user account.